A 60-year-old barangay tanod in Carcar City died when he tried to break up a fight between two women. Cesar Pantonial was kicked in the crotch by one of the women and was declared dead upon arriving at the local hospital. Joel Ramos, 45, driver of SD taxi, was more upset about being lambasted on Facebook than getting fined P1,000 for overcharging, saying the negative publicity is distressing his family. In light of the conflicting claims, the Land Transportation Franchising and Regulatory Board (LTFRB) asked both sides to bring witnesses when the first formal hearing is scheduled. 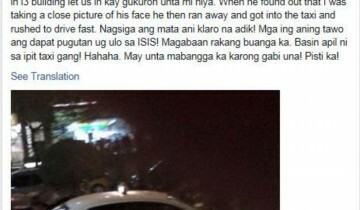 Dave Seyjorca, who accused taxi driver Joel Ramos of threatening him and his wife with a knife, posted an account of their experience on his social media account. Cesar Pantonial, a tanod of Barangay Ocaña in Carcar City, was declared dead upon arriving at the local hospital after he was kicked in the crotch allegedly by Rosarie Sarsa, one of the two women who were fighting. Sarsa denied doing so, claiming she fainted from the injuries received from her neighbors she had a fight with. She was looking for her husband, Robin, earlier that day when she saw Alicia Padin, 40, her neighbor. She suspected Padin of having an affair with her husband. Padin, irked, confronted Sarsa. The confrontation turned violent and worse when Padin’s two daughters, husband and mother joined the fight. Pantonial, who happened to be passing by, tried to break up the fight. During the incident, he got kicked in the crotch and passed out. The police is preparing a homicide complaint against Sarsa. Facing his accusers at the Land Transportation Franchising and Regulatory Board (LTFRB)-7, Joel Ramos, driver of SD Taxi, denied the allegations that he threatened his passengers with a knife after he was told to follow the P10 flag down cut. Ramos, 47, from Consolacion, challenged the couple to present the CCTV footage taken from the security camera of the establishments at the Cebu I.T. Park where the alleged incident happened. Due to conflicting claims, LTFRB asked both sides to bring witnesses when the first formal hearing is scheduled.